Step 1.) First step is to Connect your mobile with PC or Laptop via USB cable. Step 2.) Check whether your data packet is Enable or not and ensure that your internet is properly working in mobile and you are able to open web pages in your android mobile any browser. Step 3.) After performing above steps, go to mobile setting and select wireless and networks and go to “Tethering and portable hotspot”. i.e Setting -> Wireless and networks ->Tethering and portable hotspot. 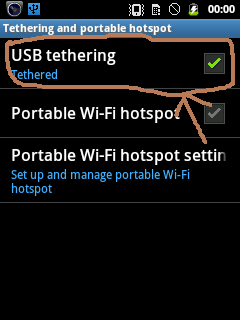 Now select “USB Tethering” and make it enable as shown below. Step 4. )Check for the “internet Network” to appear in your PC in bottom most right position as shown below, and click that icon to check the notification that if you can make internet access. If any problem persist to Connect internet in PC Laptop by android mobile with USB, you can post comment below. Nice tutorial to get connected. its not comment ..i am connected internet trough my mobile phone to laptop ….it is connected but web pages are not opening…so please give perfect solution..
Hi, It got connected but the internet is not working. it will work with wifi? I will guide you step by step and am sure after that you will be able to use internet via USB cable. Step 1. Connect your USB cable to PC or Lappy as well as your Android one. Step 2. Go to settings>>Wireless and Networks>>Mobile Networks>>Enable or check Mobile data. This is the main important step you need to enable mobile data first of all. Step 3. Go to Tethering and portable hotspot>>USB tethering option will be there click on it. After that, you can see your android packets will be sent to your Laptop or PC, and then check whether you are able to browse any pages or not. But, eve-though after performing those steps if your still unable to access then I tell you the last most important step. Step 4. Right click on My computers>>Manage>>Device Manager then check whether any device driver is missing of you mobile model and it will give you YELLOW signal as an error. Then right click on it and click on “update drivers options” if your having net then click on search automatically or online, then immediately after the device drivers installed am pretty much sure that you will be able to access internet from your mobile to PC or Laptop via USB or Wifi. I used to connect laptop via wifi.. After reading ur comment now i am able to connect via usb . try to purchase some origional cable.that cable will automatically install driver. you may be using rough or china cable. that will not help you in resolving issue. how you trying to connecting , let me know like usb , bluethoot ? it is not working…we not have to crate any dial up or any other kind of connection in our pc? I got the therted sign on my mobile but it is not connecting to my pc. Shall i hav to open mya data pack as well? If after open the data pack it will not connected then what should i do? My phone model is GT-S7262 (samsung star pro) and these options are absent . How can I do so with this model? But how to share pc internet with samsung galaxy core via usb? Can you help me some body please..
how to conect mobile in computer? If phone USB connection is problem, then try to resolve USB driver problem, or install new one. Hello… my usb tether option is not enabled even i already connect my usb cable to my laptop. My data connection is also active. still, i cannot check it. what could be the problem on this?? please help me.. thank you.! hi there! mine’s a samsung galaxy. i can connect my moblie data via usb tethering to a friend’s acer laptop,however its not working on my samsung laptop. i even checked the usb debugging option on my phone,but its still not connecting. is there any file that’s need to be downloaded? yes..! you have to download the “tetherxp.inf” file to connect the usb tethering through your mobile.then u can get the internet connection.. I got the therted sign on my mobile but it is not connecting to my pc.so, tell me how to use internet on pc. iam using samsung galaxy s duos 2 and i installed kies 2.6 version. I want to use my wired LAN which connects on my laptop to provide an internet connection to my Android Phone. I have tried converting my Laptop to a hotspot and connect the phone to this hotspot. While the phone connects to normal Wifi without any issue, if does not do so to the Laptop Hotspot. These problems with android seem to be general and discussed in web forums. Can I use USB/Blue tooth to make the flow using the wired LAN on my laptop to my Mobile. I am connected.but not working internet plz help me.. Thanks sujan for the suggestion. I can’t connect to net.there is a error on the monitor icon below. What am I supposed to do next????? Thanks , this is very helpful for me you explained in very easy way . thanks again . can I tress any mobile no locations by my android mobile phone I have Motorola’s moto e . please reply me. i got terthng sign in my mobile but netbis not connected plz give me suggestion its urgent plz reply me. My phone is micromax canvas 2. My phone get connected to my pc, usb tethering is also working but my pc i not able to load web pages or download files. It works via LAN sharing and does not shows network access. Please tell me about necessary configurations to be made in my pc if needed. My pc show the troubleshoot and show that you have invalid id??? i did all step.but in last step it shows error in device manager.then i selected the update drivers but it show windows couldn’t find driver software for your device Samsung.what i will do for that? I will connect my mobile in pc laptop . But in the USB tethering will not shown to my mobile. But my mobile will be charge in data cable . How to rectify to this problem . I have turned on tethering, bluetooth and mobile data already.Pc appears connected but no internet connection still. Why is this so? Its amazing.. Work it and Thank u so much bro..
Its Amazing and its work..
Hey thanks a lot i hv connected with pc now its all done thank u mery much…. i connected my android 2.3 phone via usb and click usb tethering. but i cannot acces internet. from where will i get samsung driver installer.? If data plan on mobile phone shared to PC, do they have the same speed? Thanks,I connect my mo. To laptop but it will ask for security key. What type of key I dont know. but my problem is can i connect it wit a samsung cell ? I am using Celkon Q500 mobile. I connected my mobile via USB cable. I got dialup number from the service provider also. But when I trying to connect my mobile to my PC. It shows the network cable Is not connected properly or it may be broken. But my mobile is very new one. Please help me. It’s a very useful to get connected in few minutes….. I use Nokia XL I tried the way you wrote above but couldnt connect it what can be the reason please I need to connect it urgently. its seem that my driver model is not installed and showing that windows counlf not find driver software for your device. Usb tethring is enable. But internet not start in pc. Thanks. Its got connected. Now i am able to access internet on my PC. I tried all the steps what you told but it is not coming……. Can you provide any solution,……..
i was followed all steps. but, when i tried to activate USB theatering it option did not highlight. so what can i do. Tried this using my android samsung I8150 with android version 2.3.6 (quite old). It worked 1st time and loaded web pages very quickly. Thanks. I am done with the above process but I am unable to get Internet connection on my pc. I connected my mobile with laptop and enable “USB TETHERING” but did not able to access internet. Showing “Page can not be displayed.” error. Please let me know how to solve this problem. my samsung mobile usb tethering not connecting. usb tethering not work , not open . I installed the yellow marked software but it is replying that , it was already installed. But it does not work. Thanks good guide of internet tethering its informative. I can now establish the connection. I followed as you mentioned, but step 4 is not working & so I could not getting access. It is saying modem or Internet would have problem. MY ICON IS NOT SHOWING AND I CAN’T UPGRADE OR REINSTALL IT. WHAT SHOULD I DO? Unable to connect mobile internet to my pc to browse internet access. Yes USB tethering is switched on but only showing the “send files” option .My mobile is Samsung Galaxy.Please help. Showing ‘Limited’ connection, no internet access. In my computer. Its not working on step 4 my computer didn’t connect to internet no connections are displayed in the connection manager that is on the bottom right corner of the window 8.1. I have window 8.1. I followed the steps , but still it is showing yellow triangle with notification as no internet access ..
Why is this so? Please help me …!!! Good screen shots to make us easily understand the step-by-step procedure to sync between Android phone and the PC. Thanks for posting this useful article. Hai friends iam already using net to my pc with through usb tathering but i have one doubt this process is shoule safe to my android moblie like iam always using like this process only…. my mobile data is on and use tethering is on but net not connected. Yellow mark is showing and no internet access. Thank yu so much..it really works!!! How to connectconnect to internet in PC with android mobile USB cable in windows xp. I’m using Samsung Tablet Galaxy Note 8.0 GTN-5100 and trying to share my mobile Internet to PC using Windows 7 when I connect the pop-up at the lower right says “No Internet access” even though I have configured the connection. Plzz tell me what to do now?? After usb tethered with pc no connection shown on pc, wts the problem ? phone is android.micromax. My computer not showing any connections ? What do I do now? I have carried out the above steps and my PC says ‘connected’ whenever I type in a URL but the pages are loading endlessly. please what should I do? i am not able to connect internet with usb. when i try to connect its shows MTP not found. Hi,I log on to your blog named “Connect internet in PC Laptop by android mobile with USB – INTERNET MOBILE ANDROID” regularly.Your humoristic style is witty, keep up the good work! And you can look our website about daily proxy.